I happened upon Ca Vang on the way to the airport. I have driven by it countless of times and have never seen the whole reason for stopping by. Luckily, I was sitting backwards in the tuk tuk and spied the three words on a streetside menu that made me stand up, hit my head on the top of the tuk tuk and yell “Holy crap!”. I told the driver to stop, pointed at a very confused Ca Vang employee and yelled “Bun Cha Hanoi? ?” Fortunately, he said yes but unfortunately, I wasn’t able to sample the dish and had to wait a few days to get my fix. 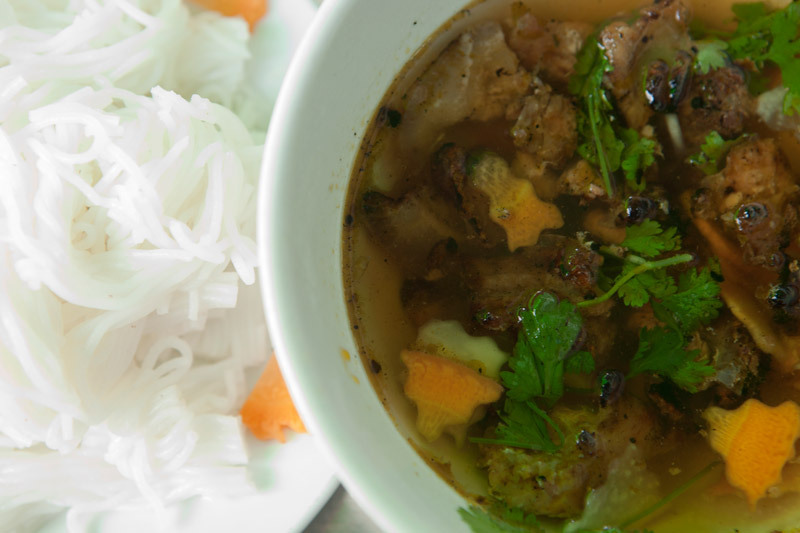 Bun cha hanoi was the favorite of all the great dishes my grandmother used to make for me during my childhood. 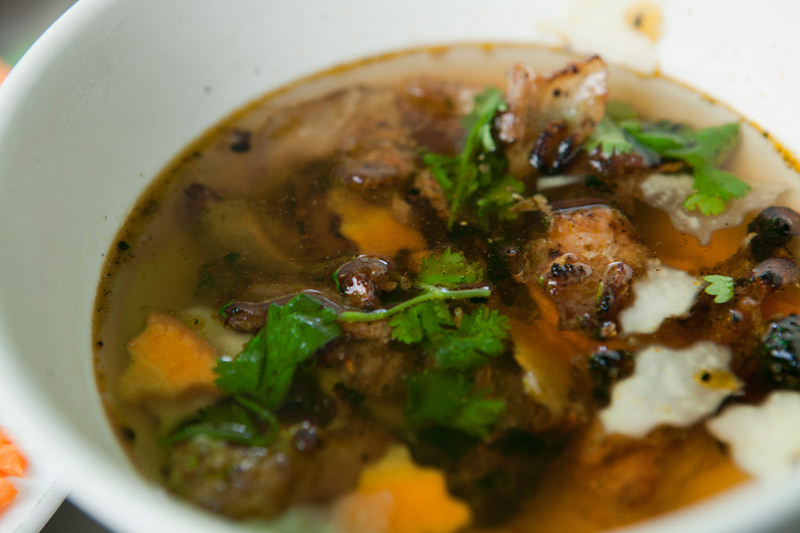 There is something so simple yet so nuanced about the grilled to the point of charring pork slices and patties combined with the vinegary, garlicky broth. 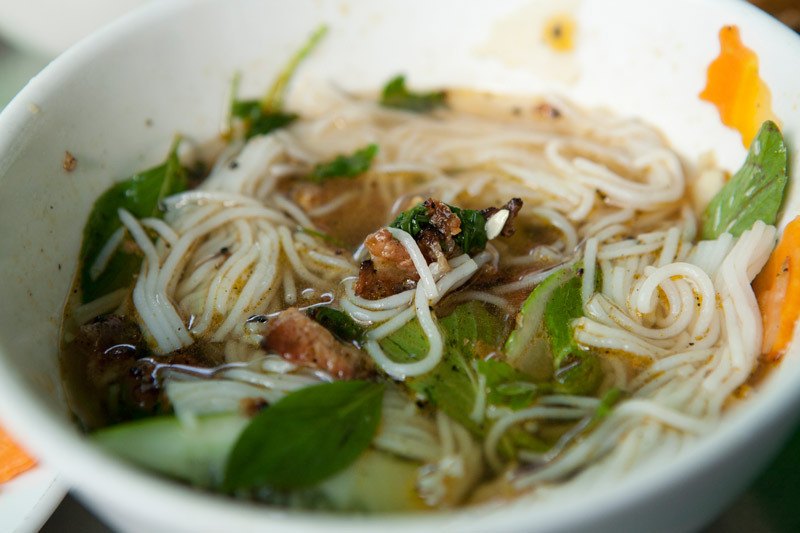 It is also quintessentially Vietnamese by the DIY nature of the dish. Along with the pork in the broth, you get a garnish of rice vermicelli noodles, green lettuce, assorted herbs, garlic and chilis. There is no real “proper” way to eat it. When I feel like getting messy, I make a mini burrito out of all the ingredients and dunk it all in the broth. Other days, I put everything in the broth and eat it with some chopsticks. It’s also non-existent in Phnom Penh which is the reason for my freaking out in the tuk tuk. So back to the restaurant. 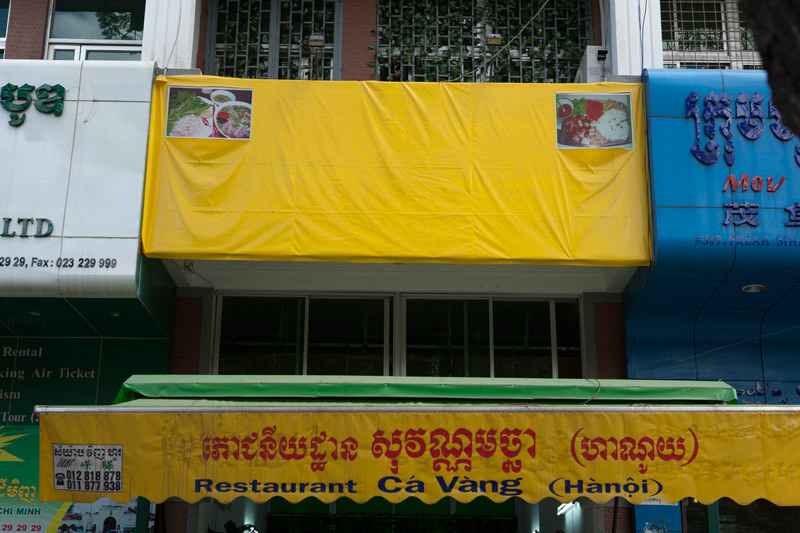 Ca Vang is a no frills street side restaurant located on a very busy street. 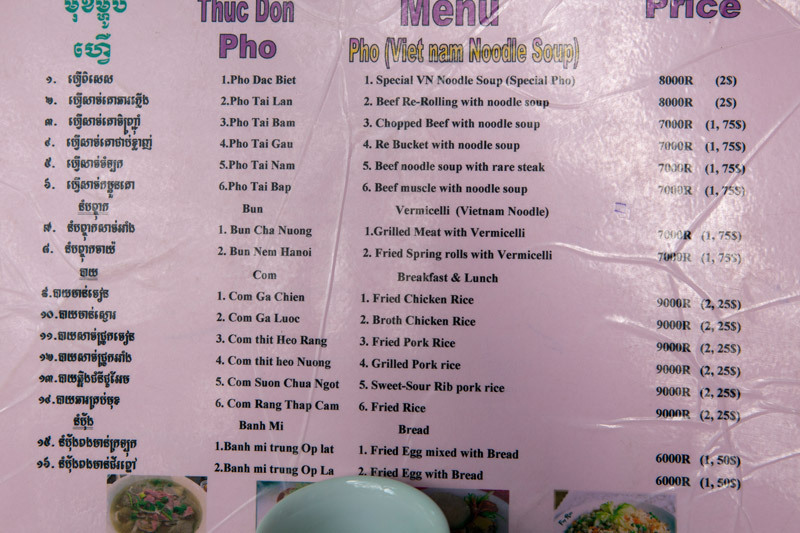 Their menu only has 4 items with several variations. I didn’t bother with the rest of the menu (though the Com Thit Heo Nuong or Rice with Grilled Pork might be worth another visit) and ordered the bun cha. 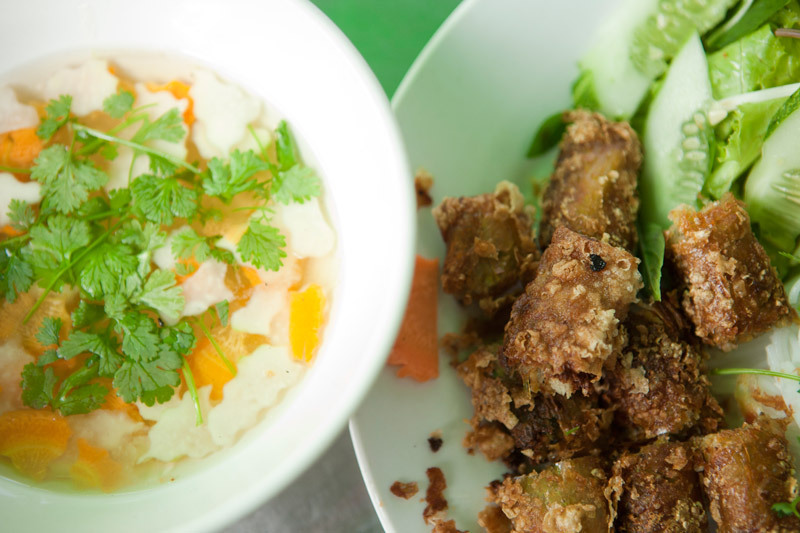 Surprisingly, Ca Vang keeps with Hanoi tradition and also offers Nem (eggrolls) on the menu! major p.s., I forgot to mention how incredibly respectable the bun nem were!